Pickleball is a racket sport in which two to four players use solid paddles made of wood or composite materials to hit a polymer perforated ball over a net. The sport shares features of other racket sports, the dimensions and layout of a Badminton court, and a net and rules similar to tennis with a few modifications. 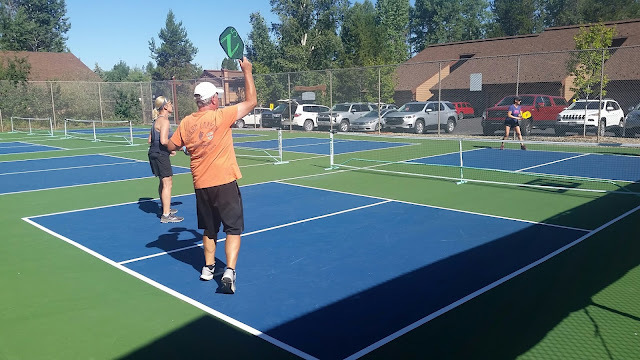 One of the fastest growing sports in North America, Pickleball was invented in the mid 1960s as a children’s backyard pastime but quickly became popular among adults as a fun game for players of all skill levels. Sunday : 9 a.m.-5 p.m.
All players must sign in at the Sports Club front desk prior to playing. The nets will be left up through the playing season so the courts will be locked during non-playing hours. Upon signing in, you may be issued a key to unlock the gate on the north-east end of the courts. Be sure to return the key when you leave. If a Pickleball member brings a guest(s) a $5.00 user fee will be charged per guest. Court shoes are required to keep the courts in the best possible condition. Please wear another pair of shoes to the court, and put your court shoes on at the court. Pickleball paddles and balls will be available for check out at the front desk. Be sure to return them upon completion of play. Due to the current parking problems for the sports club members, there will be a designated area for Pickleball players. This area will be the parking spaces by the outdoor swimming pool when entering the Aspen Village. There will be a short walk to and from the designated parking area to the courts. Parking will not be allowed anywhere around the club or in private driveways at any time. This was a provision made by the Aspen Village Board of Directors upon approving the development of the Pickleball courts.